Also available in Italian and Spanish. April 2019 - the next European elections are just over a month away. Through the vote, almost 375 million European citizens will vote to elect the deputies of the IX legislative term of the European Parliament, thus deciding the fate of the EU for the next 5 years. At the last European elections of 2009, the Eurosceptics proved to be altogether less influential. Indeed, the worst outcomes were found only in Poland, Sweden and Denmark. Nevertheless, the 2014 European elections as a whole have shown substantial growth of Eurosceptic MEPs who have been able to achieve further consensus within European Parliament debates and plenary sessions. Over recent years, the Eurosceptics criticizing the excessive bureaucracy of the EU institutions, the adoption of the single currency at the expense of national monetary sovereignty and fiscal policies like the Fiscal Compact, have increased substantially. Other issues have been added to the question of the euro and political integration, including: 1) a European Agenda on Migration and 2) the defence of national borders. The new European security and migration issues have mainly affected the Euro-Mediterranean countries that have suffered most from the EU’s inability to make progress on a common immigration policy. Furthermore, the economic, political and social crisis of our continent – mainly caused by the collapse of Lehmann Brothers – has led to the emergence of several long-term electoral consequences. Many citizens, affected by the great economic recession, have subsequently expressed their electoral frustration, both at national and European level. In the face of an economic downturn with few historical precedents, millions of European citizens have embraced anti-immigration and anti-European proposals whose peak has been represented by the 2016 vote on Brexit and the Italian elections of 2018. Many European think tanks and newspapers agree that the 2019 European elections can be a turning point for the future of the European Union. Some even speak of a moment to decide between a “Europe of nations” and a Europe of supranational institutions based on the Community method. Considering this unique appointment with history, some questions arise spontaneously: what does it mean to be Eurosceptic? What exactly are we referring to? 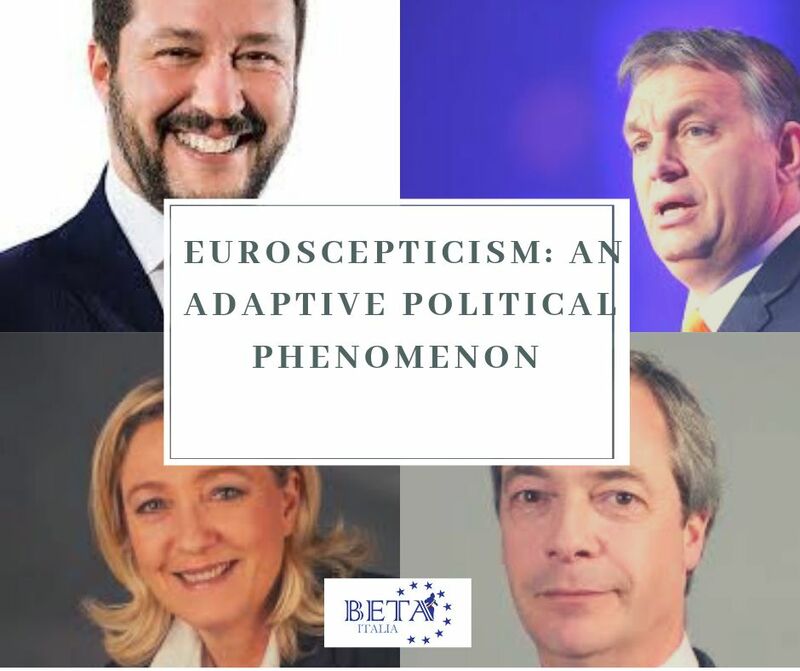 It is extremely difficult to identify an exhaustive definition of the political concept of “Eurosceptic”, as Euroscepticism has a multidimensional and dynamic nature and is capable of involving diametrically opposed political forces. However, Euroscepticism can generally be understood as an extreme phenomenon, both of the left and of the right. Extreme left-wing parties normally believe that the European Union represents the pinnacle of the capitalist project and, on the other hand, far-right parties interpret the Union as a sort of “Leviathan Ordinator” which undermines the defence and sovereignty of nations. Firstly, we are talking about a dynamic political phenomenon that has changed over time, depending on the historical context. Therefore, Euroscepticism is an adaptive political phenomenon. Secondly, Euroscepticism cannot be understood as an expression of a single political ideology, since it includes several political actors such as parties, social movements, national institutions, citizens and civil society. Finally, we cannot speak of a homogeneous political phenomenon because Euroscepticism involve both the left and the right, sometimes including positions along the moderate political spectrum. Like all political movements in Europe, Euroscepticism has a history that has evolved in parallel with the process of European construction. History contributed to gradually defining the political agenda of the Eurosceptics. We should remember that, for instance, even at the time of the signing of the Treaty of Rome (1957) some French and German Christian Democratic parties feared the birth of an international organization such as the European Economic Community (EEC). Furthermore, since the 1980s and 1990s, many left and right parties have begun to see the EEC as an organization that promotes privatization policies, unbridled capitalism and liberalization of national labour markets based on models of deregulation. After the signing of the Maastricht Treaty (1992), the image of an increasingly “bureaucratic” and “technocratic” Europe has grown substantially, contributing to creating a “European question” across the continent. Despite the multidimensional nature of the political phenomenon and its apparent incoherence – especially if we consider its “hybrid” nature which unites both right and left parties and approaches the best-known populist phenomenon – it cannot be denied that today Euroscepticism is an integral part of our European political debates. It challenges the very nature of the Union and has become a movement whose message can no longer be ignored; a political phenomenon which joins the endless challenges faced by the European integration process throughout its history. In the next article I will try to present a complete map of the main Eurosceptical parties and movements in Europe, addressing in more detail the hot topics of the upcoming 2019 European elections.